Foldable phones look set to finally come to market in a meaningful way during 2019, so with that in mind it’s likely that we’ll start to see more and more leaks as time ticks on. Yesterday saw what may be the latest of those leaks, with the normally reliable Evan Blass sharing what is said to be a video of an as-yet unannounced Xiaomi device. While Blass urges caution and reminds users that the authenticity of neither the video nor the device itself cannot be confirmed, if this is legitimate it could prove to be very interesting indeed. Shot in darkness, the video appears to show what at first is a tablet, but with that tablet later folding at two hinges, revealing something more akin to a phone. The video starts out with Google Maps running in Tablet mode and, on the face of it, behaving as fluidly as is to be expected. Everything works well, but things get interesting when the device is bent at two hinges to form a phone-sized layout. The interface reacts to the folds, and then eventually goes from large tablet, to small tablet, to phone-sized interface fluidly enough to make us think that this isn’t an early prototype. However, as the video is shot in darkness, it’s impossible to see what the device looks like. Given the icons on show it’s believed that this is indeed a Xiaomi device, running a build of Android 9. 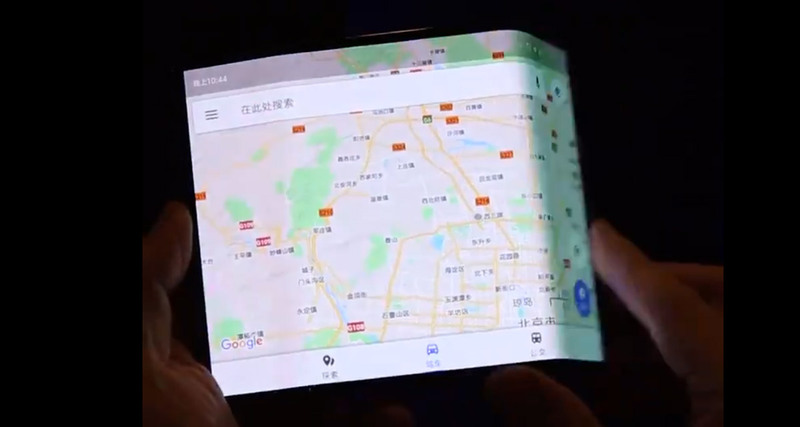 We know that Google is being hands-on with foldable Android devices already, and there is some suggestion that this may be the result of a partnership between the two companies. We’ll have to wait and see whether that pans out, but this is definitely appears to be further proof that we are going to see more and more foldable devices this year. It looks real but the problem is going to be long term durability.